ASI makes a line of Cyanoacrylates that are specially formulated to bond instantly, like nothing you’ve ever seen before. The trouble with instant adhesives is sometimes the “instant” part. Anyone who has ever tried this type of glue knows that “instant” is just shorter than the time it takes for you to realize your fingertips are now permanently stuck together. 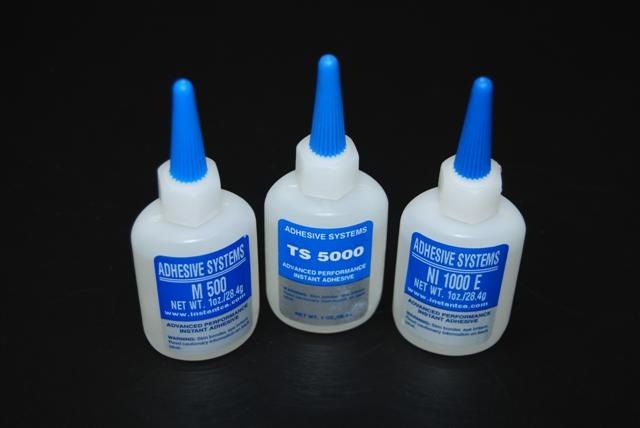 Our Advanced Performance Series adhesives are available in a wide range of viscosities. The thicker the adhesive, the longer the working time. The other benefits of thicker glue include the ability to apply it on vertical surfaces, as well as increased gap-filling properties. There are also special formulations for Rubber/Plastic, Metal, and Surface Insensitive (for everything else). There’s a CA for everyone! Instant adhesives provide an economical and FAST solution where a permanent bond is necessary, but screw holes, or other mechanical fasteners are not desirable. Call us today for more information about our Advanced Performance adhesives.